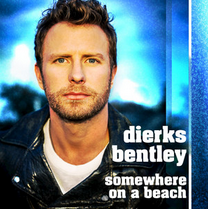 Laid back and catchy from Dierks on this new one. This is one of my favorite times of the year. First, we’re past the holiday season and while that’s great it’s nice to fall back into the normal routine. It’s a New Year with new opportunity. Maybe you’re starting a new job. Maybe you’re working on a new health plan. It’s a new start and that also means new music from a lot of country artists. It’s usually a time when artists like to release at least a new single. Here is a brand new one from Dierks Bentley. This one is really cool. It seems like the next step in the career of Dierks Bentley. He’s always had his own style. A little country. A little rock and he dips into other styles as well. This one I would say maybe dips a little into the R&B or Hip Hop movement in country. Just a little bit. I’m not suggesting that Dierks is hip hop or anything like that. But there are some funky beats in this one. The song is about a guy that is telling his ex-lover that he’s easily moved on from her. She might be wondering how he’s doing and all that business, but he’s on a beach with some friends. The girls are looking good and everyone is having a good time. Sometimes it’s best to get away while you’re trying to get over. This one is catchy. It’s something a lot of people can relate to. It seems to have the ingredients to become a hit.